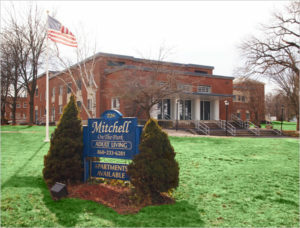 Welcome to Mitchell On the Park, located at 226 Prospect Street in Wethersfield CT. Mitchell On The Park is an adult living community which is located adjacent to Mill Woods Park. Conveniently located on the bus line, just minutes away from the Silas Deane Highway and Berlin Turnpike with easy access to major highways and shopping centers. Arranged around a central courtyard, Mitchell On The Park’s beautiful and spacious apartments are completed by high ceilings and new large windows that take full advantage or natural light and peaceful surroundings. Independent living residents can select from different floor plans ranging from Studios to one and two bedroom apartments all designed for comfort, convenience and charm. Each unit features a full size stove, refrigerator, central air conditioning, garbage disposal and dishwasher. Many of the units have a washer and dryer hook-up within the unit and there is also various community laundry rooms within the building. The building also has a central community room, an inviting space for all residents to enjoy.